Eid is just around the corner and everyone is damn busy in preparations to decor their homes for this upcoming festival and sacrifice. Pakistani brands are also busy in launching their latest eid collections as soon as possible. As you know, women are always fond of shopping, they want new dresses, foot wear and accessories, whether its is time to attend any function or event. Most of the middle class families avoid from hassle of getting a new dress then take the dress from tailor, and at the last day the dress is quite misfit. To avoid such situation, here is Women Eid-ul-Azha Dresses Collection 2017-2018 by Pakistani Designers that is stitched or unstitched but available in standard sizes and every girl love to buy such cloths which are just ready to wear. It becomes very difficult to find an appropriate dress for such event, so no need to worries we are here to cheer you guys as we have collected Festive Eid Dresses Collection by famous brands. Now these assortments are available at all retail stores and online. The effort to becomes pretty and gorgeous becomes very easy task for divas. So these collections not only contains Stitched but unctitch dresses as well, in order to designs in your own style. Enjoy these ravishing prints and adorned outfits in order to make your look mesmerizing on this auspicious event of Eid! The Holy event of eid is just approaching and the preparations for this occasion among women getting faster day by day. As it is the biggest need of women to look gorgeous and graceful, you need something special as we are showcasing here. 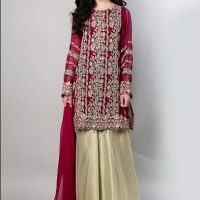 Pakistani Top Brands Women Eid Dresses Design 2017-2018 Collection consist of casual trousers, embellished tulip pants, bell bottom trousers pairing with short and long shirts as well as embroidered peplum tops. Ladies are always seems to be passionate about new styles and fashion. So in order to make them happy and cheerful we have collected stunning imaged by famous Pakistani Brands. These dresses will give you both casual and party wear look. 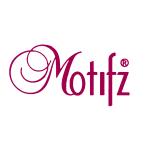 Asim Jofa is the top ranked Pakistani designer, which always provide the ultimate solution of women clothing. They always launch seasonal as well as occasional collection for girls and women. The best thing about this latest collection that contains mesmerizing prints, while shirts also contains stunning embroidered work on front side. Dupattas borders are delicately embroidered with patches, laces and stone work. Straight pants, bell bottoms are paired with long and short shirts and peplum type frocks. The best thing about these dresses, these are available at economical prices that can be easily affordable by middle-class individuals. Sania Maskatiya a female fashion designer of Pakistan need no introduction, always rocks the fashion market with her fabulous collections that contains Eastern as well as Western Style apparels. The team of SANIA knows it very well how to play with colors and embroidery. This festive collections also contains latest style dresses with latest cuts. Peplum top, short frock, tail gown pairing with sharara trousers, cigarette pants looking alluring. The name of elegance and styles “Maria.B” has brought its newest and stylish Eid ul Azha Collection 2017. Each outfit in this range consist of fabulous embroidered work on front and back. Cut work is done on laces and sleeves side. This assortment is not less then a miracle for fashion lovers on this holy festival. Use of pastel and soft shades making each dress a master piece. The Riaz Arts creation now named as “Charizma” becomes the style statement for fashion lovers. The brand always unveil collections in volumes like I, Vol II, Vol III etc. Now this eid they have unveil ravishing assortment contains not only lawn dresses but also chiffon and swiss range. Front open style, beautiful flared frock,straight shirt with modish cuts making this assortment juts an amazing gift for ladies to rock this eid. Zeen is a women’s line carrying lawn prints, pert and party wear. Zeen continues with the Cambridge Brand to prove their customers high quality fabric embellished with latest cuts and styles. 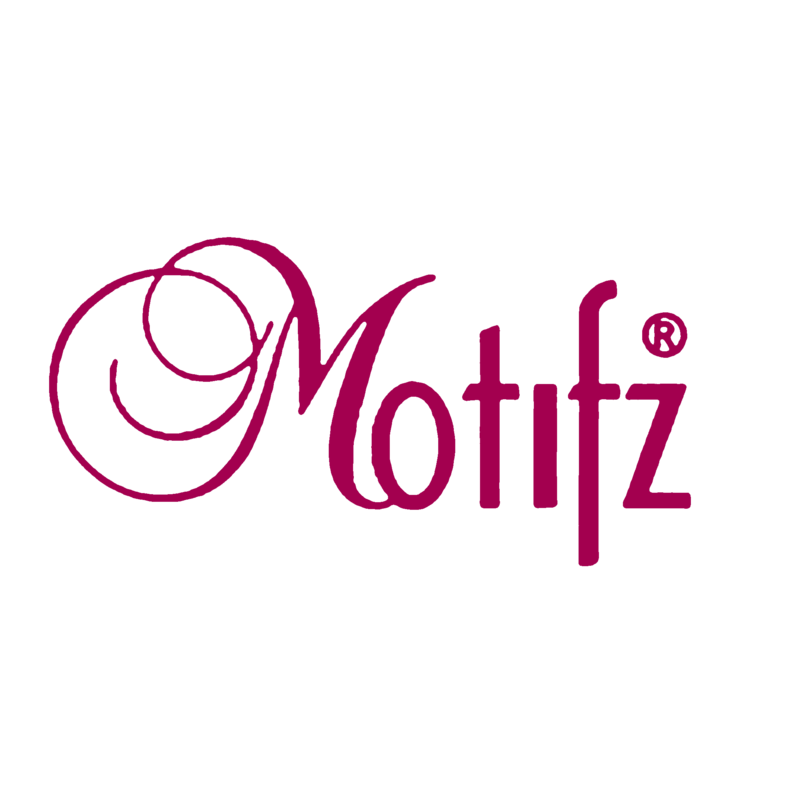 To be the heartbeat of fashion lovers, they don’t compromise on high quality fabric and design. Let’s talk about eid collection, each dress contains round neck, boat neck and v-neck gala style. Each dress is giving luxurious look, as these are adorned with floral work. The name of elegance presented formal dresses for this holy festival. The collections includes beige, brown, black, purple, cyan and zink color. Beautiful tassels, and embroidered tissue fabric patches are added to make this series more glamorous. While these are paired with boot-cut and plain trousers. Elan always comes with awesome collections for women in chiffon, silk and pure fabric. The beautiful dresses are not only styled for girls but also for ladies. 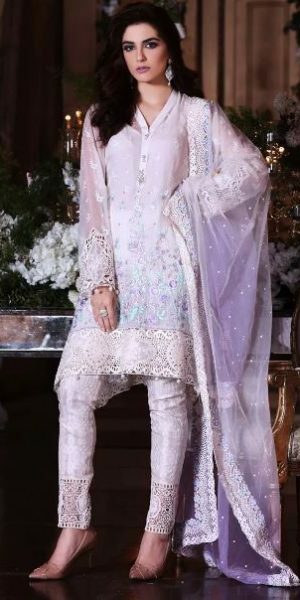 Each attire is heavily embroidered to rock this eid as well as weddings. In some outfits, inner are kept quite simple while uppers or gowns are embellished with embroidered cut work laces. 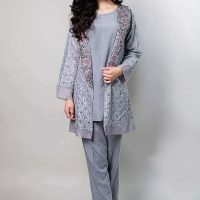 With the arrival of Eid season, Pakistani brands has launched their latest eid collection.All these assortments are enriched with delicate embroidery and prints.